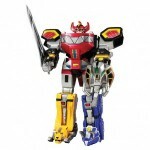 Our site sponsor BigBadToyStore.com has had an incredibly busy week with tons of new pre-orders and new releases being announced. In an effort to narrow down what you’re looking for on the toku side, we’re happy to bring you their latest newsletter as well as the latest offerings in the world of tokusatsu! Check out the new releases and current pre-orders below! New Arrivals and In-Stock Now! New and Current Pre-Orders – Some items due to arrive very soon – order now so you don’t miss out! There’s lots of incredible items coming up that you don’t want to miss out on! So what are you waiting for? Check out BigBadToyStore.com and take advantage of their exclusive Pile of Loot shipping method – why pay for shipping all your items individually when you can combine them in to one package? Read on for the full newsletter! Pre Orders for the set will be closing on May 17th 2015 with a shipping date sometime in July, the set retails for 7,560 yen. Our site sponsor BigBadToyStore.com has sent out their newsletter featuring new pre-orders and new arrivals for all of your various toy collecting needs! Slipping under the radar are some pre-orders for some of your favorite series – Kamen Rider Drive, Shuriken Sentai Ninninger, and Power Rangers Dino Charge! 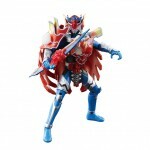 There’s also more Kamen Rider Gaim available! Check out the listings below! Now in Stock & New Arrivals! For all your toy collecting needs – please check out BigBadToyStore.com and take full advantage of their Pile of Loot system – allowing you to stash toys in to a safe, secure location so you can combine your shipping on other items as they come in! Take advantage of one of the only North American online toy stores to offer this premium service! Also be sure to follow them @BigBadToyStore on Twitter to get up to the minute updates on new pre-orders as they are put up online! Check out the full newsletter for all the new pre-orders for things like Transformers, Marvel, DC, Star Wars, and more after the jump! Premium Bandai finally opens up pre orders for the latest Arms Change set featuring Zangetsu Proto-Suika Arms and Baron Taboo Arms. The official pre order page gives an in depth preview of how this set functions, specifically the new shield weapon for Zangetsu appears to have a moveable handle to allow more variety with posing. With the Gaim Gaiden DVD coming out in April, a new set emerges! 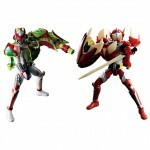 This new two-pack of Arms Change Figures consists of two key Riders from Kamen Rider Gaim, Zangetsu and Baron in their Gaiden-exclusive Arms, Watermelon Arms and Ringo Arms respectively! Accessed through the Proto-10 Watermelon Lockseed, Watermelon Arms is a remold of Zangetsu’s original Melon Arms, with a modified gatling gun-shield weapon. Baron’s Ringo Arms is accessed through the LS-Taboo Forbidden Ringo Lockseed, utilizing a repaint of Kamen Rider Mars’s Golden Arms, right down to using the same weapons. Preorders for this set open March 2nd and end on May 18th, with the current estimated price of 7000 Yen. Be sure to tell your usual middleman! Youtube reviewer k2eizo has put up a video review of the most recent Premium Bandai release- Arms Change Yomotsuheguri Arms! This unique configuration for Kamen Rider Ryugen appeared very briefly towards the end of the series, unleashing a sinister type of power during the final stages of Zawame City’s Rider War. Arms Change PB06 will cost roughly 4000 Yen before shipping and middleman fees and is available now! After months of teasing, Premium Bandai finally opens up pre orders for the latest and what could be last Arms Change figure: ACPB07 Duke Dragon Fruit Energy Arms straight from Movie War Full Throttle. Pre Orders will be going live on Christmas Eve and closing on March 9th 2015. ACPB07 will be releasing in June 2015 retailing for 4,320 yen. The Images showcases the Arms in combinations with Shin Zangetsu, Duke, and Marika! Do check them out after the jump. 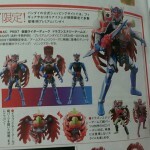 We finally have our first look at the latest Premium release in Kamen Rider Gaim’s Arms Change line! 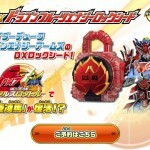 ACPB07 Kamen Rider Duke Dragon Energy Arms was just teased on the Premium Bandai website and now not only do we have this initial image, but also release details! As we can see the original AC Duke’s been slightly remolded to reflect this form as it appears in Drive X Gaim Movie War Full Throttle. The actual Dragon Fruit Energy Arms bears some engineering resemblance to the original Lemon Energy Arms. Duke Dragon Energy Arms will retail for 4320 yen, pre-orders will be open from December 24th (Christmas Eve) through March 3rd 2015 with a release mostly likely in April or May. 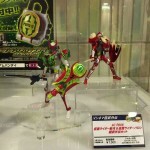 Good news for fans of Gaim and Arms Change collectors! 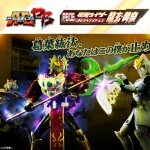 While it was previously believed that ACPB06 Kamen Rider Ryugen-Yomi Yomotsuheguri Arms was going to be the last Premium Bandai Arms Change release (due to the recent reveal of the first TKPB, Proto-Drive), a new image has surfaced on the preorder page for the Dragonfruit Energy Lock Seed! 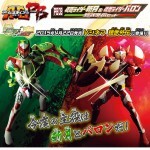 This image is a teaser for ACPB07- Kamen Rider Duke Dragonfruit Energy Arms! This new form appears on the big screen in Kamen Rider × Kamen Rider Drive & Gaim: Movie War Full Throttle, but according to the teaser, we won’t see him in toy form until December 24. Stay tuned (click the story to see the teaser)! Revealed just recently via magazine scans, we have official images for the first Tire Koukan SP release! Kamen Rider Drive Type Fruits is a new form for Drive exclusive to the Kamen Rider X Kamen Rider Drive & Gaim: Movie War Full Throttle film. The TK figure of this form includes versions of Kamen Rider Gaim’s Daidaimaru & Musou Saber. 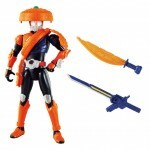 The base Drive figure of course sports a spiffy new orange & blue color scheme to match his samurai buddy. Drive Type Fruits will be released on December 25th and retails for 3200 yen.